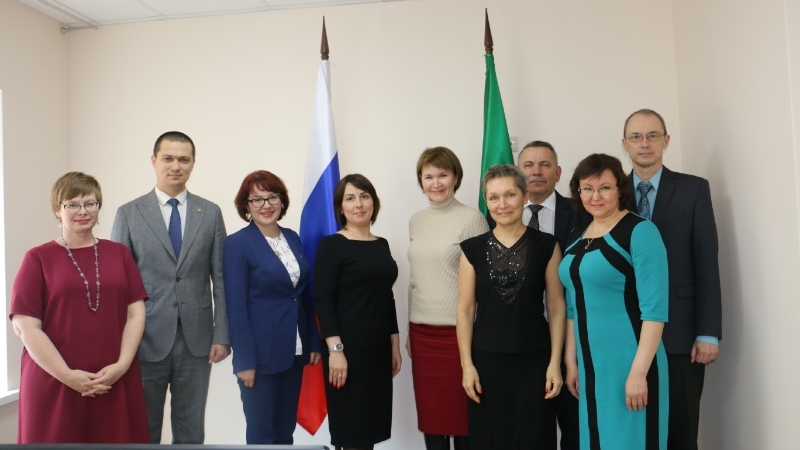 On 21 and 22 March, 2019, traineeship to channel «Anti-corruption assessment of laws and regulations» of specialists of legal services from the Investment Development Authority of the Republic of Tatarstan and Almetyevsky, municipal district was held in the Ministry of Justice of the Republic of Tatarstan. The staff of structural subdivisions of the Ministry - mentors conducted practical classes on the topic. The purpose of traineeship was necessary theoretical teaching acquisition and practical skills in matters relating to anti-corruption assessment, improving the quality draft laws and regulations being prepared. The meeting of the commission was held with discussion of the internship experience. Minister of Justice of the Republic of Tatarstan Zagidullin R.I., Deputy Minister of Justice of the Republic of Tatarstan Ibyatov M.M., Deputy Director of the Higher School of State and Municipal Management of the KFU Aksenova N.A., Head of the educational programs of the Higher School of State and Municipal Management of the KFU Khabibullina G.A. took part in the closing of the internship program. Sirotina E.R. and Khannanova A.B. received certificates of a standard pattern at the end of the internship.